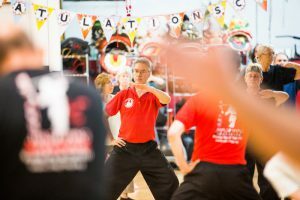 You might have seen Billy Greer and his students—children, parents, and elders—demonstrating the Chinese martial art of Taiji (tai chi) at the William Paca House or Maryland Hall for the Creative Arts. If you watched them long enough, you might have felt tension easing out of your body, for even watching Taiji has that effect. But what you won’t have seen is the years-long exploration of movement, the constant “preparation posture” that is Greer’s life. Participants in a Tai Chi class utilizing movements with weapons, Billy Greer leads. Gongfu (kung fu), literally hard work and time, characterize Greer, age 59, who has moved steadily to where he is today, heading up Jing Ying Institute in Severna Park, where he teaches Gongfu and Taiji and enjoys hosting Chinese martial arts teachers. It’s also where he and his wife, Nancy, spearhead outreach for a variety of community-based fundraisers that have yielded more than $60,000 for local and global needs since the 2005 Asian tsunami. A “Navy brat” from Trinidad, Greer was small for his age, had poor sight, a speech impediment, and was nonathletic. He related better to books than people until a junior-high wrestling class, during which he was matched against students his size, his vision wasn’t a disadvantage, and he focused on strategy. He embraced the sport and wrestled for Bayside High School in Virginia Beach. Hard work and time led him to join the gymnastics and cross-country teams to enhance strength and flexibility and improve endurance. By senior year, he captained all three teams. He continued running and wrestling while in college at Hampden-Sidney, Hampden Sydney, Virginia, where he majored in biology and pre-med and earned various sports awards. In the 1970s, Bruce Lee and the Kung Fu TV series popularized martial arts. But despite reading about martial arts, watching martial arts films, and constantly talking about martial arts, Greer didn’t take the plunge then—Nancy did. 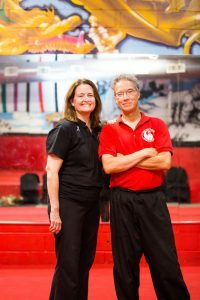 In college, she gave him a set of nunchucks, a traditional Okinawan martial arts weapon, and he taught himself how to use them. They married in 1982, and five years later, she gave him a one-month trial membership to a karate school in Glen Burnie. Not quite what he wanted, it spurred him to examine other schools. At the next school, they studied Tian Shan Pai Gongfu with Tayari Casel. Casel, an African American Gongfu practitioner, had studied with Dennis Brown, the most senior disciple of the man who brought Tian Shan Pai Gongfu to the United States, Grandmaster Willy Lin. Greer did what he always does when he’s serious about something: he got a book—in this case, an out-of-print book that he photocopied—and began studying. The book’s author, Grandmaster Lin, had studied Tian Shan Pai Gongfu with the Chinese teacher who brought it to Taiwan. According to the book, Lin had his own school in DC’s Chinatown. But the book was out of date. Greer checked and found Lin no longer taught, dashing hopes of studying with him. In 2001, the Greers began studying at Jing Ying in Severna Park, run by instructor Mary Martin. It sprang from East West Martial Arts, an Annapolis school that had closed. 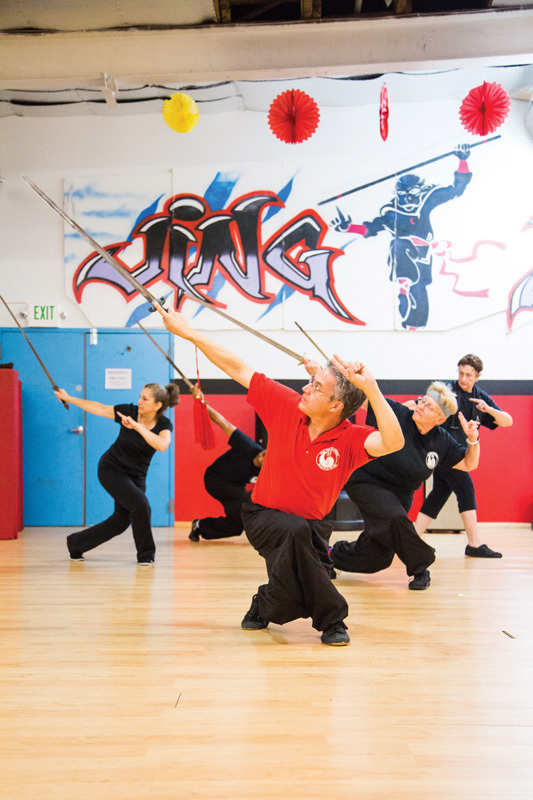 Its 6,000 square feet and high ceilings were ideal for traditional Chinese martial arts. After three years, says Greer, Martin asked if the Greers had ever thought of running a school. By August 2004, she told them if she couldn’t find a buyer, she would have to close the next month. full-time parents. Greer, whose work had shifted from running a lab to IT and who had kept a consulting business for lab-related work, quit both. Despite the income hit, Nancy eventually moved to the school full-time, too. In 2005, Greer finally met the two men who influenced him the most and began training directly with them—Grandmaster Lin and Grandmaster Chen ZhengLei, a descendant of Chen WangTing, who lived from 1580 to 1660, and reportedly combined his previous training with theories from early Qigong to create Taiji. Because Taiji was banned during the Cultural Revolution, Chen ZhengLei trained in a cemetery to avoid detection. “The flat area of dead grass from his training soon spawned stories of ghosts and evil spirits that helped ensure no one was likely to venture out and discover him training at night,” Greer says. Greer went through traditional BaiShi ceremonies with Lin and Chen, which means he is a formal disciple of both—a third-generation inheritor of Tian Shan Pai Gongfu and a twelfth-generation inheritor of Chen Taiji. For 2018, Greer is organizing a trip to Taiwan for Lin, who turns 80, and to Chen Village in Henan Province, China for Chen, who turns 70. Both, says Greer, move like men half their age. “I don’t know how I got so lucky as to be accepted as a disciple of two people who epitomize the ideal of the ‘scholar warrior,’” he says. Billy Greer leads a Tai Chi class. During Taiji warm-up stretches, Greer often sways or bounces gently to engage his whole body. Focusing on breathing and slowness creates relaxation and enhances the ability to learn movements correctly and efficiently. It also helps develop a hyperawareness that integrates mind and body, especially as students build up “listening energy,” says Greer, which is paying attention to all the senses. Participants in a Tai Chi class. Billy Greer, standing in front of traditional Chinese Lion costumes. A “future Kung Fu and Tai Chi master” – Payton is the newest addition to the Greer family. Billy Greer leads Tai Chi class. Nancy Greer makes announcements after class about Halloween parties and fundraising, while holding her grandson, Payton. 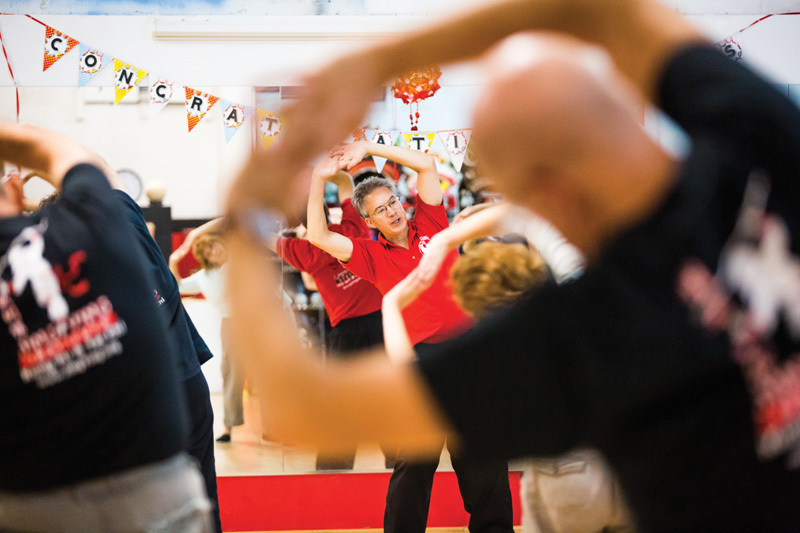 Billy Greer leads a warm up during a Tai Chi class. Traditionally made Chinese lion costumes. Billy Greer laughs with wife Nancy after class. Participants in a Tai Chi class, Billy Greer leads. Error: Error validating access token: Session has expired on Saturday, 09-Mar-19 15:57:50 PST. The current time is Tuesday, 23-Apr-19 09:49:56 PDT.